Giving your skin a flawless, natural-looking glow can be as easy as applying your daily body moisturizer. 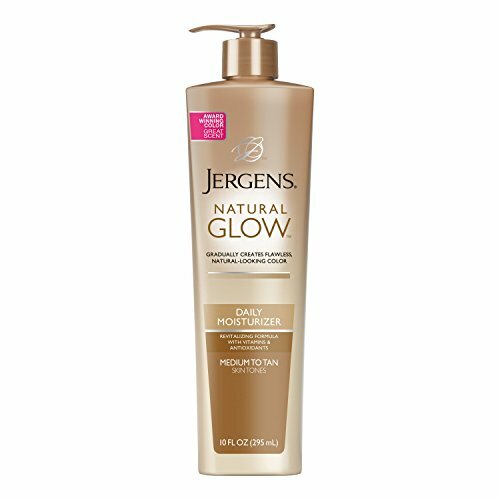 Jergens Natural Glow Daily Moisturizer for Body gradually delivers subtle color even when the beach is miles (or months) away. Applying at least once a day will enhance your natural skin tone within several days, and in about one week, you’ll have beautiful, natural-looking color. Jergens Natural Glow Daily Moisturizer for Body also contains a blend of hydrating ingredients, antioxidants, and Vitamin E, so your skin stays nourished while getting its glow on. For best results, apply to freshly cleansed and exfoliated skin. Allow to dry for several minutes before dressing. Wash hands immediately after applying. With daily use, subtle color will begin to develop within several days, and you should expect to see a beautiful, natural-looking glow in about one week. If the color change is not noticeable enough, apply Jergens Natural Glow Daily Moisturizer for Body more frequently. Once you have reached your optimal shade, continue using daily to maintain your glow. Our Jergens Family believes in letting your beautiful shine. As we have learned from our mothers, passed down from generation to generation, beauty is so much more than skin deep. Whether you are looking to illuminate, hydrate, revitalize, nourish, restore or heal, every one of our products are thoughtfully designed to bring out your skin’s beauty in a way that reflects your true self. Because we know when the real you shines through, you make the world a more beautiful place…every single day. If you have any questions about this product by Jergens, contact us by completing and submitting the form below. If you are looking for a specif part number, please include it with your message.